Apple's Digital AV Adapter is one of the easiest ways to connect your iPad to your HDTV. The adapter plugs into your iPad through the lightning connector, which is the port under the Home Button normally used to charge the iPad, and an HDMI capable can be plugged into the other side, allowing you to hook it up to your TV. 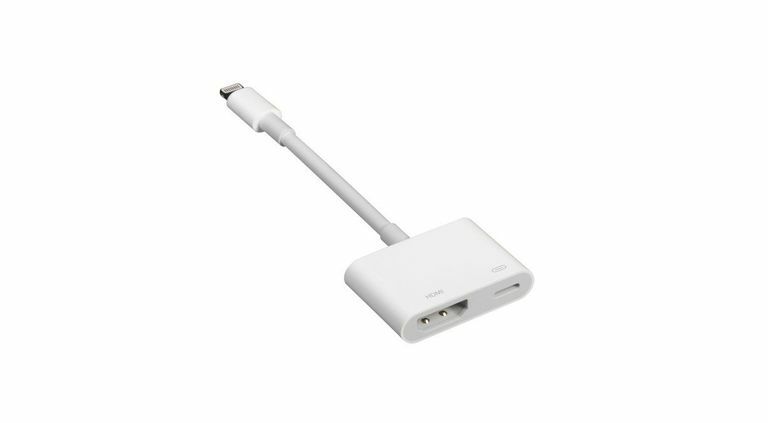 The Digital AV Adapter also has a second Lightning adapter port, so you can continue charging your iPad while it is connected to your TV. The adapter goes hand-in-hand with the iPad's display mirroring feature. While many streaming apps like Netflix and Hulu Plus support 1080p video output through the Digital AV Adapter, the iPad's display mirroring allows anything on the display to be mirrored on the television. This means you can use it with apps that don't support video output. Why Shouldn't You Buy the Digital AV Adapter? There are two ways to sling your iPad's picture to your HDTV's screen. The first is Apple's Digital AV Adapter, and it does a good job of it. The second is AirPlay, and it does a better job. AirPlay uses your Wi-Fi network to send video to your television. This makes it a great wireless solution. You don't even need to be in the same room as your television. So long as you have a connection to your Wi-Fi network, you can use AirPlay. This means no worrying about cables. It also means no getting off your couch if you want to switch shows or play the next episode of what you are watching. And because there are no wires, you can still easily control the iPad. This is great if you are playing a game on the iPad and want to see it on your big screen TV. But How Much Does AirPlay Cost? The Digital AV Adapter is pretty affordable and is available from Apple's website or other retailers. In order to use AirPlay to connect your iPad to your TV, you will also need Apple TV and HDMI cables, so that's going to add to the cost, but the extra expense doesn't just buy you a wireless connection. It buys you Apple TV. Apple TV comes with tons of apps, and some are the same ones you might want to stream from your iPad, including Netflix, Hulu Plus, and Crackle. So in many cases, you won't even need to hook your iPad into your television, which frees up your iPad for other uses. Apple TV also gives you access to buying or renting movies and television through iTunes. Apple TV also works with music and photos. There are actually a few different ways you can get Apple TV to stream your music. You can use AirPlay to stream it from your iPad or iPhone, or if you subscribe to iTunes Match, your music collection should stream from the Internet. As an alternative to iTunes Match, you can also use Home Sharing to stream your music collection from your PC. Your shared iCloud Photo Library will also be available on Apple TV. So it can work as a really cool screen saver. And if you really like the idea of Apple TV, you can skip the cheaper version and buy the newest generation Apple TV. It's definitely more expensive, but it also has the same basic processing power as an iPad Air and access to a full-featured App Store. Are There Times When the Digital AV Adapter is the Better Solution? In most cases, you will get more bang for your buck going for the Apple TV solution over the Digital AV Adapter solution. But there's one key area where the Digital AV Adapter is definitely the superior solution: portability. Not only is the adapter much smaller than Apple TV, it's also a lot easier to hook up to a television. In order to get AirPlay to work, both devices must be on the same Wi-Fi network. At home, this isn't an issue, but if you need a solution for work, such as hooking your iPad up to display a presentation, the need to all be on the same Wi-Fi network can become a burden. If you need a very mobile solution, the Digital AV Adapter is still the way to go. The Adapter is also the most foolproof solution. It doesn't take any extra software detection to get working, so it will work 100% of the time. What if My TV Doesn't Have an HDMI Port? There are a few options for older TVs. First, you can buy a composite AV cable from Apple, but this cable uses the old 30-pin connector for the iPad. If you have a newer iPad with a Lightning port, you will need the 30-pin to the Lightning adapter as well. That's obviously not the most eloquent solution. A better route would be to go with a breakout box or cable adapter that converted the HDMI signal into component (the blue, red and green cables for video) or composite (the single yellow cable for video). You can find some options by searching Amazon for "hdmi composite" or "hdmi component." The upside to going with an adapter is that can be used for more than just hooking the iPad to your TV. You could use it for anything that has HDMI out such as a game console.